If the following default network parameters not suit your network settings you need to configure the Webswitch 1216H’s network settings in order to be able to reach the web interface for further configuration. 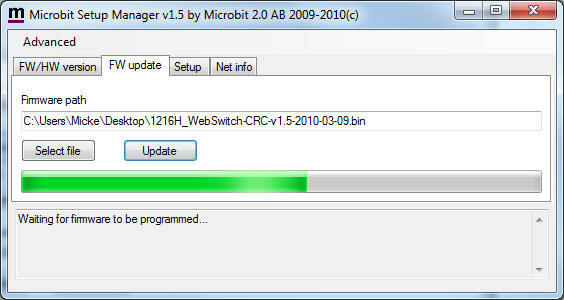 The initial IP settings are done by using the Setup Manager program on a Windows PC with an USB cable connected to the Webswitch 1216H. You can also take the chance to update to the latest firmware if your device hasn’t got it already. 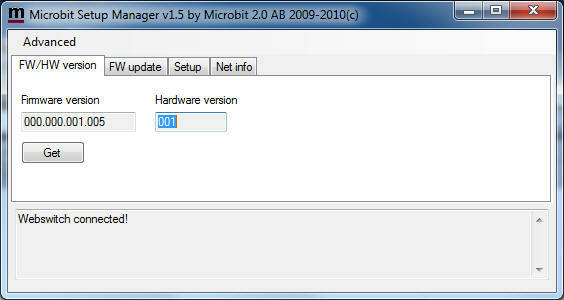 Start with downloading the Microbit Setup Manager. Save the downloaded file to the desktop. Install the Manager by following the instructions which shows up. If you have an older operating system installed where Net Framework 2.0 is not installed, the installer will guide you through the installation of the Net Framework. When you have finished the installation a new shortcut to the Setup Manager will show up on the desktop. Click on the icon to start the Setup Manager. Connect your Webswitch to 12V and connect the USB cable (USB-A to Mini-USB) between your computer and the USB jack on the Webswitch. Windows will automatically install the necessary drivers. When it’s done the text in the bottom field will change from “Unknown disconnected” to “Webswitch connected” which is an indication that you are in connection with the unit. Click on the “Get” button. The version of the built in firmware will show up in the upper window. Check the firmware page for the latest firmware, if there is a newer software available download it to your desktop and if it’s a zip-file then unzip the bin-file inside. If you already have the latest version installed you can go directly to Setup down below, otherwise change to the “FW-update” tab in the Setup Manager. Click on the “Select file” and browse to the file you just saved to your desktop, the should be something like 1216H_WebSwitch-CRC-v1.5-2010-03-09.bin depending on the version and release date. 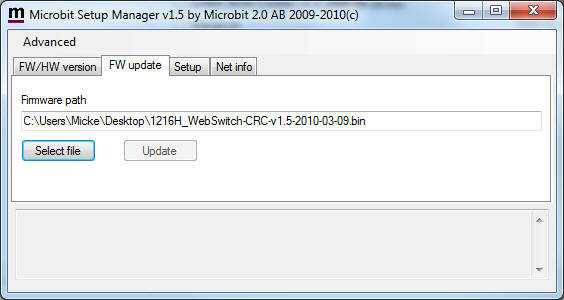 When you have found the file click on the “Update” button and the uploading of the file to the Webswitch will start. Attention! do not interrupt the upgrade process in any way by for ex. unplugging the power source. After about a 30 sec the update is finished and the Webswitch will restart. When the text “Webswitch connected” shows up again in the lower field of the Setup Manager, you can change to the “FW/HW” tab again and check that the unit now shows the latest software version. Now change to the “Setup” tab and click on the “Get setup” button. A new dialogue window will show up with the default IP settings already there. 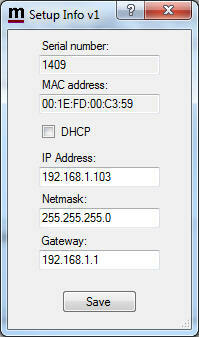 Change the settings so they fit into your local network and the press the “Save” button to save the new settings. The Webswitch will restart again. When the text “Webswitch connected” shows up again in the lower field of the Setup Manager, you can click on the “Get Setup” button again to check that the changes has been done. After the initial settings are done and you have connected the Webswitch to your network you can browse to the Webswitch’s internal home page and continue the setup from there.